2019 superyacht racing is off to an exciting start with more great competition ahead. January was highlighted by two successful regattas – the 9th annual Superyacht Challenge Antigua and Auckland’s Millennium Cup. Down under participation should jump significantly in 2020/21 with the America’s Cup expected to attract a meaningful superyacht fleet. A robust Bucket regatta promises terrific class racing in St Barths in March and early tallies from the Med are pointing to fleet gains at both the Loro Piana Superyacht Regatta and the Palma Superyacht Cup in June. The SYRA Superyacht Racing Rules and Fair Sailing committees had a productive fall and winter. applicable Case Studies and the 2019 appendix are certainly worth checking out. Barths Bucket. 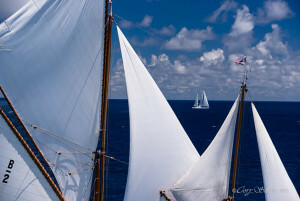 The SYRA’s Fleet Building Committee will meet in St Barths to consider other initiatives. racing than in previous years. The latest edition of the ‘SYRA Newsletter’ was emailed to members in early February and is posted here. for all those involved in superyacht racing. The 2019 Annual General Meeting will be held in St Barths on Wednesday before the start of the Bucket. discussions and contributing through the committees and working groups. questions or feedback, please reach out: peter@superyra.org.